India: Massive Expansion in Schooling, Too Little Learning, Now What? The Indian NGO Pratham pioneered the use of simple, face-to-face, out-of-school assessments of basic learning at a massive scale—their typical annual report covers more than 500,000 children. The ASER reports have tracked the levels and trends in learning (tragically, there has actually been learning retrogression) of children aged 5 to 14 in rural India since 2004. Now comes the same basic approach, but applied to assessing the conditions of youth aged 14 to 18, in 28 districts in 24 states. Covering over 30,000 youth, ASER 2017: Beyond Basics was launched in India on January 16, 2018 (see the launch videos and more) and assesses four aspects of current youth: Activity, Ability, Awareness, and Aspirations. The good news is that access to schooling has expanded—81 percent of youth (age 14 to 18) have completed at least basic education through Grade 8. Moreover, most of them are still in school (54 percent in Std X or below, 25 percent in Std XI or XII, and 6 percent in college). Only 5 percent are enrolled in vocational schooling or courses (of which 59 percent are short-term courses of six months or less). But the main story of the youth assessment is a massive mismatch between their aspirations of how they will be able to use their schooling and their actual capability. The ability of youth to actually solve simple concrete problems is distressingly low, and gets much lower with any added complexity. For instance, 83 percent could correctly tell time when the clock said 3 o’clock exactly. But when the clock said 4:45 (or quarter to 5), only 59 percent were correct—meaning 41 percent could not tell time. And when told a girl went to sleep at 10:30 pm and awoke at 5:30 am, only 60 percent could say how long she slept. While most could tell time, most could not use time in simple, practical ways. Furthermore, 77 percent could read a simple Grade 2 passage, yet when given a poster with instructions on how to use ORS packets (an important potential application of literacy), only 54 percent could read the instructions and give correct answers as to usage. So, while most read, far fewer can use reading. When told it takes three chlorine tablets to purify 15 liters of water, only 50 percent could say how many tablets would be needed for 40 liters (one tablet per 5 liters). Only 38 percent could say correctly how much a shirt with listed price of 300 Rps on sale at a 10 percent discount would cost. Only 22 percent could calculate how much would be repaid if one borrowed 20,000 Rps for one year at 11 percent interest. So, while most can do simple arithmetic, few can use arithmetic to solve straightforward problems. 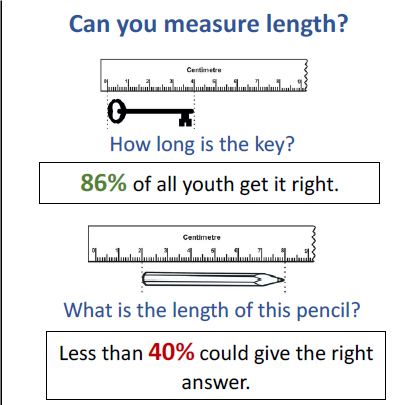 One particularly instructive test item, first developed and used by Educational Initiatives to show the gap between rote learning and conceptual mastery (or learning with understanding), is to ask youth about measurement. In one question, the object is flush against the ruler and hence the length is just where the tip of the item reaches—86 percent of youth get this correctly. In a follow-up question, the item is displaced from the end of the ruler. Anyone who has an understanding of length and measurement understands length is the difference. But when the item was displaced, only 40 percent answered correctly. Less than half of the 86 percent, which a standard curricular assessment of rote mastery would say could calculate length, actually had any understanding that would allow them to use length and measurement. Source: The ASER 2017: Beyond Basics presentation. This gap between rote learning and learning with understanding is an important concern, particularly in places, like India, that rely extensively on high stakes for students’ tests. As a recent (December 2017) RISE paper by Newman Burdett shows, these tests often contain little or no assessment of higher order skills—but performance is often what motivates students and parents. This assessment of Indian youth confirms what has been indicated many times: the typical young person in India, even when they and their parents have made sacrifices to attend many years of school, are far, far behind their peers in other countries in skills, capabilities, and the ability to apply knowledge to the real world. In 2008, Jisnhu Das (a member of Pakistan’s RISE Country Research Team) and a co-author used TIMSS comparable questions to compare student results from Rajasthan and Orissa and found they ranked 43 out of 51 countries—and due to high inequality, the weakest students (5th percentile) in these two states were ahead of the weak students in only three countries. In 2009, Himachal Pradesh (HP) and Tamil Nadu participated in the OECD PISA assessment, which measures the ability to apply skills. Even in HP, which many regard as the leading state for education in India, 89 percent of 15 years olds performed at Level 1 or below in science (compared to 18 percent for the OECD). The spectacular skills of a very thin globalized elite—and there is no denying that in every field, from science to economics to novels to business, some Indians are at the top—have allowed many to remain in denial about the gap between the aspirations of India’s youth and their actual abilities. This is where the Beyond Basics report is at its most poignant. Sixty percent of Indian youth today aspire to study beyond Grade 12. Only 43 percent of this cohort can do simple division (a 3-digit number divided by a one digit number), only 40 percent knew 10:30 pm to 5:30 am was seven hours and only 38 percent can calculate a 10 percent discount. This means substantial numbers of Indian youth have educational aspirations—college or university level study—for which they are totally, radically, completely unprepared. Youth also have unrealistic aspirational occupations, often to work in government: 18 percent of boys wanted to be in the Army or Police and 25 percent of girls wanted to be teachers. Unfortunately, in the 2015/16 Employment Survey in India, all of “public administration and defense” was 1.6 percent of employment and all of “education” was 4.3 percent of employment. The video, Beyond Basics: Stories of Youth, illustrates the enormous gap between the aspirations of youth (to be in the Army, teachers, naval officers, policemen) and their current skill sets—and the complete lack of guidance or support they have to make their dreams realities. Though great progress has been made at expanding access to schooling, lurking just beneath the surface among Indian youth is a sense of dhokha—or betrayal—that the destinations on which they embarked their schooling journey seem almost as far out of reach as when they started. ASER’s new pioneering work on youth highlights the urgency of addressing the learning crisis. These children started school after the Sarva Shiksha Abhiyan (SSA) was launched (in 2000-1) and in the Right to Education Act era (since 2010) and are still emerging into young adulthood radically unprepared to achieve their ambitions. Will we find in another decade that yet another generation of youth have passed through a low-learning education system? What is going to make the difference? This blog post was originally posted by RISE—the large-scale education systems research programme supported by the UK’s Department for International Development (DFID) and Australia’s Department of Foreign Affairs and Trade (DFAT). Experts from the Center for Global Development lead RISE’s research team.